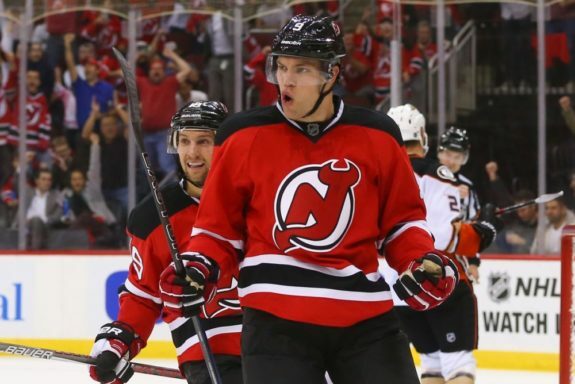 NEWARK, N.J. — Taylor Hall scored the game-winning goal on a breakaway at 8:07 of the third period and added an empty-net tally to lead the New Jersey Devils to a 4-2 victory over the struggling Pittsburgh Penguins on Tuesday night. Hall’s game-winner came a little less than four minutes after Guentzel tied the game. It came on a quick counterattack. Kyle Palmieri sent a pass from the Devils’ defensive end to Zajac at the Penguins’ blue line. Zajac sent a pass to Hall coming down the middle, and last year’s MVP made one move and slid a soft shot between DeSmith’s legs. Guentzel’s sixth goal of the season tied the game at 2 after withstanding a challenge by New Jersey coach John Hynes, who claimed Sidney Crosby interfered with Kinkaid. Kinkaid had stopped Crosby’s semi-breakaway, but the skate of the Penguins’ star knocked the goaltender to the ice, leaving Guentzel an open net to shoot at with the rebound. The Penguins tied the score 1-all with Kessel’s power-play goal at 13:19. Crosby held the puck in the right circle and fired a pass to Kessel stationed at the left edge of the net for a slam dunk. The Penguins nearly tied it on the ensuing Devils power play, but Bryan Rust’s short-handed shot was kept out by a combination of Kinkaid and the goalpost. NOTES: Goaltender Martin Brodeur, who was inducted into the Hockey Hall of Fame Monday, dropped a puck in a ceremonial opening faceoff before the game. … Devils centre Nico Hischier, the No. 1 pick overall in last year’s draft, missed his first game with an upper-body injury. He is day to day. Zajac took his place on the top line with Hall and Palmieri. … Penguins F Evgeni Malkin played in his 800th NHL game. Coincidentally, his first was against New Jersey on Oct. 18, 2006, and he scored a goal. … Devils F Brian Boyle was placed on injured reserve with an upper-body problem. C Pavel Zacha was recalled from Binghamton of the American Hockey League.